I’d heard about NaNo before, but only vaguely and never by anyone really enthusiastic about it. It had always existed vaguely in the background, as in ‘Oh, that thing where some people write a novel in a month.’ It seemed like a very isolating and impossible-pipe-dream challenge, and not really worthy of my time. Then, I graduated university with a degree in Literature and Creative Writing and found myself at a loose end, terrified out of my wits that I was never going to write anything again and my creativity would stagnate and die. After all, once uni was over, I had no purpose, no community and no inspiration. In October 2013, my wife suggested that we do it together. We met through fanfiction and both enjoyed writing, and the challenge was something she’d thought about doing before but never actually attempted. I agreed, pulled in by the promise of two free paper-backs, and I decided that this would be my test: If I couldn’t do this, I wasn’t worth my salt as a writer. It wasn’t easy – I completely pantsed, going with a glimmer of an idea I’d had years back, rather than my plan was expanding my uni dissertation – and after three years of having to really care about quality and content, it was hard to silence my inner-critic, but once I got going and once I stopped caring, it was the most exhilarating and rewarding experience of my life. I finished on the 25th, in time for my first thanksgiving, and I remember watching the wordcount hit 50,000. I couldn’t believe it. The year before, I had struggled with 6,000 words in nine months and here I was, with a complete story (I never finish anything, ever) and I had proven that I could do it. NaNoWriMo has given me the confidence to believe in myself. Because of NaNo, I am now a freelance ghostwriter and an editor, who can churn out good prose in a short space of time; I have met my first cast of my own, original characters that I feel like I can connect to; I have written almost every day for the last twelve months, and I can honestly, truly call myself a writer. This year will be NaNo number two, and I’m going to make the most of every moment! 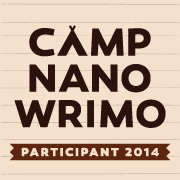 This year, I’m writing the sequel to NaNo 2013 – The Moon Path. My two main characters – Dakin, aged twenty, and his thirteen-year-old brother Laurie have achieved their goal that; they have escaped from the island they have been trapped on all their lives, and now they find themselves on the other side of the ocean, in the midst of an Empire in chaos. Having lived their entire lives in isolation, the brothers have a steep learning curve ahead of them and, with Dakin suffering from severe withdrawal symptoms from the Somnium Interdit (a drug which is given to every child of the Empire at the age of thirteen to stifle their imaginations) and not a clue how real-life works, it’s going to be a tough ride. They will learn that the difference between friends and enemies is not always as clear as it ought to be, and sometimes the only person you can truly trust is yourself. I’m really excited about it. The landscape is going to be much bigger, the cast a lot wider… there’s going to be dragons. Dragons are always good. More sub-plots than I know what to do with! I expect it’ll turn out completely different to how I envision is, but isn’t that the fun of NaNo? Ah, that’s a really cruel question… Just one? Oh god… I think I’m going to pick Wendy by Karen Wallace. I picked up this book when I was thirteen (I think) and I’ve read it so many times since, I’ve lost count. It’s really unique, and I wish there were more books like it. It’s very loosely based on Peter Pan, but the link is so subtle and surprising… It’s brilliant! It’s quite a domestic story about a little girl growing up in the early 20th Century, who sees something from behind the banisters that changes her whole world. It’s a very special book to me, and I cannot recommend it enough. Have fun. Use the opportunity NaNo gives to be wild and experimental. Throw caution to the wind and write purely to please yourself. If you can do that, you’ve won, no matter what the word count. Ironically, when I was little, I was the only one of my friends who didn’t want to be a writer. I think I realised that that was my calling when I was thirteen and discovered fanfiction. Having an audience gushing over your work is very addictive, and I was hooked immediately. It was what I was good at – the only thing I was really good at. Most of the people around me have a lot of different skills, but I’ve only ever had one and, to be honest, I think that’s been good for me. My mindset has always been, ‘If I don’t have this, I don’t have anything,’ so I work hard to achieve and be the best I can be. I have a long way to go, but half the battle is perseverance, so… Fingers crossed! Write because you have to, because nothing else will do the job of getting everything out of your head. Write to please yourself, as if no-one else will ever see the words you’ve put down on the page. Write everywhere. There’s no such thing as The Perfect Place. Write in front of the TV, on the car-ride home, on the toilet, at the kitchen table. Write because the world inside your head is your happy-space – your world away from reality, your quiet time separate from the stress of the real world. Write because no-one in the whole world is as qualified as you to write your story and the world will be worse off without it. Write to one person, whether it’s your mother, your beta, your best-friend or that stranger that never fails to review, even if it’s just say, “I liked it.” If you have just one person, you have an audience, and they are worth keeping. Write even on the days you don’t want to. The longer you put it off, the harder it will be to come back. Write because nothing feels as good as seeing those words down on the page. Thanks for joining us, Esme! 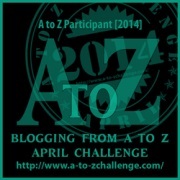 This entry was posted on Tuesday, October 14th, 2014 at 7:07 pm and is filed under Wrimos. You can follow any responses to this entry through the RSS 2.0 feed. You can leave a response, or trackback from your own site.